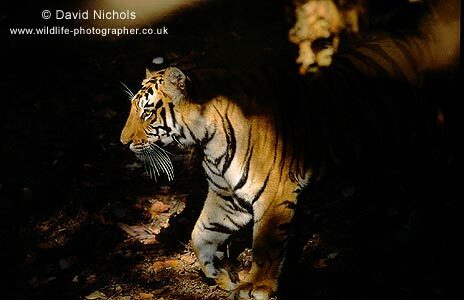 A Bengal Tiger (panthera tigris tigris) steps into a shaft of light from her hiding place deep in the jungle of central India. Crowned ‘the king of the jungle’ in Kipling’s Jungle Book and ‘guardian of the west’ in Korean mythology, the Tiger surely plays a more important role in human psyche than any other animal. Once abundant through out Asia they are now a symbol for conservation and represent mans struggle to balance conflicting needs and desires. No more so than in India, home to 1 billon people, where the natural habitat is declining and Tigers are protected. I photographed this magnificent female from the safety of an Elephant during a three-day trip to Bandhavgarh National Park.